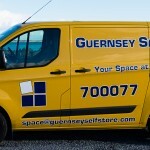 Look out for Guernsey’s Self Store Van as we collect our customers’ items for storage. We’ve got a busy week ahead zipping across the island, Saturday will be especially busy so keep your eyes peeled. Photographs will be judged by Guernsey Self Store with help from Tim at Custom Creations Photography*. The one we like the best will win £100 and the runner up will receive £50. We’re not looking for technical expertise or even artistic merit, just fun photo’s of our van as we collect items for our self storage customers. Submitted photo’s must have been taken between Monday 28th March and Saturday 2nd April (inclusive). Winner prize £100 cash. Runners up £50 cash, to be collected from Guernsey Self Store. No equivalent prize will be offered. All entrants grant all rights for Guernsey Self Store to use the submitted photo’s plus the entrant’s name in any future publicity and marketing. Employees of Guernsey Self Store are not eligible.